It's about a girl called Gorgie Parker and her horse Tyro. Gorgie really wants to go to Blainford, a horse boarding school. When she gets in its all about winning and fighting to stay at the top. They have a sequel called Show Jumpers and another entitled Riding Star. I love this series. It's really moving. This is like one of the best! All horse books I love is mostly by Stacy Gregg, I wish the series go on!!! I love this book because it's realistic and inspirational. love these books so much! stacy gregg is brilliant! and i really got lost in the story felt like i was riding belle with georgie from cross-country to showjumping to polo, totally awesome series of books! this is the best series ever! I recommend it to anyone. I love this book it's so realistic and inspiring. Whenever I read it seems to transports me to Lexington and I'm galloping along with Georgie and Belladona! I love this book because it's inspiring. Hi all! You will always find a review where people will say that a horse book is great... but no horse books can beat these! Honestly, as soon as you read the first word of one of the books you won't be able to put it down. Stacy Gregg makes everything seem so real - you might find yourself crushing on the boys or crying! I highly recommend these books to anyone - and I would say start with the first books and work your way up the series. I have the whole collection of PCS and PCR so far, and I would say that The Prize is my favorite so far! If you haven't read one of these books you're missing out on an amazing read(:! I CAN'T WAIT FOR THE PRIZE TO COME OUT !!!!!!!! A great Stacy Gregg book! Georgie Parker is head over heels when polo boy James invites her to stay at his mansion, but can she really fit in with the jet set? Back at Blainford rivalry hots up as Georgie and her horse belladonna excel in the show ring. Can they beat the showjumpers at their own game? This book was awesome. Stacey Gregg is my fave author! 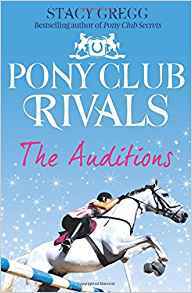 i love this book and pony club secrets! i have just read showjumpers. its cool!